Cette belle propriété est dans l'extrémité sud de l'île. Il est entouré par la nature et est en bord de mer. Belle promenade de deux minutes à la plage magnifique avec beaucoup d'oiseaux, y compris les pélicans. Profitez de ce bel endroit paisible et pourtant à quelques minutes des restaurants sur Santini Plaza et le cinéma de plage. Aussi juste quelques minutes en voiture de Lovers Key State Park. La maison dispose de quatre chambres et trois salles de bains et demi. Trois chambres ont des lits queen, et de belles vues sur le golfe. La quatrième chambre a deux lits doubles. Cuisine ouverte et salon et grand porche, jardin arrière est votre plage privée. Vues magnifiques de presque partout dans cette maison. Un endroit pour tomber amoureux! Il y a 3 1/2 salles de bains, deux salles de bains à l'étage et 1 1/2 en bas. séjour maximal est de 8 y compris les enfants. This house was perfect for our family vacation. There was plenty of privacy in the bedrooms, and several places to gather in the large, open common room and the large deck which made it very comfortable for us all. The walk to the beach involves a small bit of wading in water that was below our knees, so no problem at all. This is on the quieter end of Fort Myers beach, and it was beautiful. The housekeeping was not perfect but it was basically clean - they just missed some things that dropped behind a bureau, for example, so more a matter of not being 100% thorough but it was fine. Certainly not the nightmare that one of the other reviewers described! We would love to stay here again. 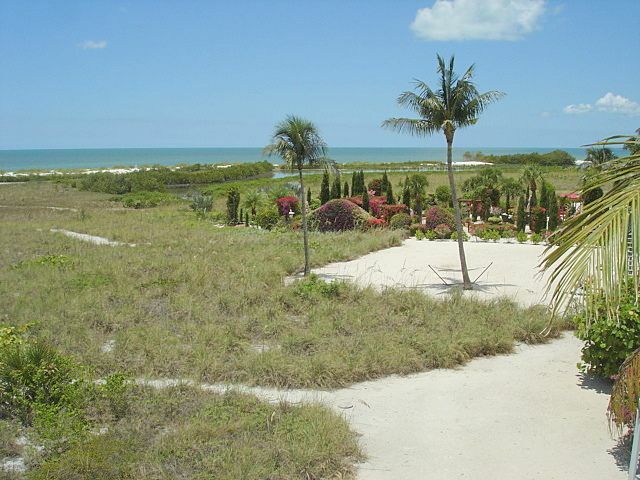 It is a wonderful place to relax with plenty of space, and in a beautiful part of Florida. Beautiful locale. Lots of wildlife, we saw manatees migrating birds, daulphins. It's a hike from the house, maybe five minutes, to the beach, through water. But once we got there, it was a totally private beach. There were some cleanliness issues that were addressed. We should have had some warning about the sand fleas that are voracious at that time of year. Overall, we had a great vacation. Nightmare. We rented a house for 10 days. I could write two pages of problems and unacceptable behavior by the landlord. I will summarize not to make it too long. It started by not having neither one of the two sinks or the dishwasher because the disposal was broken and the sinks were clogged. Landlord wanted us to wait from Saturday to Monday to get it fixed. We couldn't go without washing dishes. So I demanded on Sunday for it to get fixed. She got really upset and wanted to kick us out of the house. She said she would give us two hours to get out. Once she realized the money issue, she changed her mind and told us she would fix it. The handyman that she hired was able to fix the sinks but not the dishwasher. Also we had leaks on two of the windows. The handyman covered both top bedroom windows with a tarp to prevent the water to go down to the leaking windows. So for the whole 10 days we did not have a view from the two top bedrooms. For the whole time we were there the air conditioner upstairs wasn't working properly. We complained a few days later and she got someone to go fix it. He didn't, so he went there on Sunday and fixed it. Definitely not fun spending the day waiting around for the handyman on my vacation time! I also don't think that the description of the beach access is accurate. You have to go through a lot of bushes and to cross the lake is not that easy. We ended up walking ten houses down the street to the nice part of the beach. Also the house describes having beach chairs etc. Well, they are disgusting and all thrown towards the back of the garage. In my opinion the maintenance problems could even be fixed, but the problem is the horrible customer service and a landlord with a horrible attitude. She is not friendly and you could get into major problems if you have any issues and you complain to her. I have pictures and text messages between us and the landlord to prove everything I am saying. Beware! I tried my best with these renters but they were very difficult. They checked in on Saturday and the cleaners had just cleaned and the disposal was not broken. On Sunday they called that the disposal was not working and sink was clogged. I come over with a handyman on Sunday and they were very rude to me. The disposal had whole corn in it, and this is why it broke. The dishwasher was never broken it was just not draining because of the disposal. A couple of days later they called again because of the AC and I had someone out there immediately to repair. Was not a good AC company and they had to go back, but they got it working for them. I do realise that because during their stay Fort Myers Beach had the most rain in 112 years, it was not a pleasant vacation for them. But I really cannot take responsibility for the weather and I can't refund them their stay. The house being a rental needs a lot of maintenance which we do. We like to take care of our house and our guests. The house has gorgeous views and is very comfortable. It is beautifully decorated and furnishings are good quality. Deck has been recently painted. Toilet it not sound not that this would have been a problem for us. We had plenty of towels 8 sets plus beach towels. We enjoyed the house and the beach and will return. My wife and I, our 2 adult children, their spouses, and our grandchildren stayed a week. We had a wonderful time. The house was spacious and gorgeous. We weren't "tripping over each other." The furnishings were all very good quality. When we weren't at the beach, the adults spent a good deal of time in the main living area, a bright 2-story space. The grandchildren spent a good deal of time on the floor in the "sitting area" at the top of the spiral staircase, using their electronic devices. The bedrooms were good-sized. The beds were comfortable. The bathrooms were spotless. The kitchen was well-appointed. We ate in 90% of the time. We never encountered any difficulties with cookware, dishes, glasses, utensils, etc. The views toward the gulf are wonderful. Access to the beach is straightforward ... takes maybe 3-4 minutes. The location at the extreme south of the island was ideal for our group. Far less traffic than further north, yet easy access by car to a shopping center, drug store, supermarket, and a very fine fish restaurant. I've read a couple recent reviews and will offer a couple comments. Yes, there was a noise at the end of the flush cycle for the master bedroom toilet. It was an oddity, or perhaps even a minor irritation, but didn't detract from our enjoyment of the house. Yes, you can get splinters walking barefoot on the main deck. We solved that by implementing a "shoes only" policy that worked just fine. The spiral staircase and rear exterior staircase might well be a problem for very young children, but our youngest grandchild was 8 and never encountered any difficulty, nor did we ever fear for her safety. The lanai, accessible from the master bedroom and main deck, had some torn or missing screens. Although unattractive, this didn't present a problem for our group ... this was not a "buggy" season. The upstairs decks ... accessible from 2 upstairs bedrooms ... were in poor shape. We didn't use them at all, but that didn't detract from our enjoyment of the house. It would present a problem, however, to a group that wanted to make use of those decks. Despite the issues with the exterior, the interior of the house, its beach access, and its south island location were all 5-star in my judgment. Our enjoyment of the house was 5-star. So I feel the house deserves an overall 5-star rating. We'll stay again. That said, as noted, perhaps the house would not be a good choice for a family with very young children. Upon arrival on the first evening at around 8.30 pm (after a journey of nearly 22 hours) we discovered that the whole house had not been cleaned and the beds had not been made. Dirty laundry was lying everywhere. The fridge was full of used groceries. We had to spend the night at the neighboring house. The telephones were not working. We had to call A.B. in Switzerland on our private mobile phone. The TVs were not installed and did not work in all rooms. A ceiling ventilator in the upper room (sea side) was broken. We had to replace about 10 broken lightbulbs after the cleaning ladies hat refused to change them. The terrace furniture was torn and unusable. The flyscreen, if existing, was also torn. The airconditioning was much too loud when cooling. The stove had a defective contact and did not work. We could not cook from 15 February till 24 February. A new stove stood in the citchen but was not connected. We found dirty underwear and cigarette packs inbetween the matresses. Some of the bedspreads were soiled with urine and had to be cleaned at our own expense. Some workmen entered the house unlawfully and without notice at least twice while we were out. My personal legal protection insurance remitted the compensation for my claims directly to me for reasons of cost and the savings of legal fees in the USA. Photographic evidence can be viewed at my place or provided by me. Once and never again at Bertschingers.